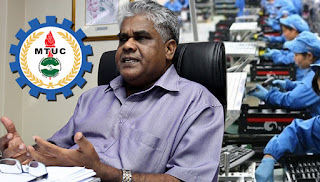 The Malaysian Trades Union Congress (MTUC) has questioned Putrajaya on the need to bring in 1.5 more million Bangladeshi workers, saying that the exercise went against its policy to have only 15 per cent foreigners in the labour force by 2020. MTUC secretary-general, N Gopal Kishnam, said there were already 2.1 million documented foreigners in the country, while another four million are believed to be illegal. With the arrival of the 1.5 million, he said migrant blue-collar workers will make about 20 per cent of the population. “Why is there the need to bring in more foreigners, especially from Bangladesh?” he asked. Mr Gopal said this in response to Deputy Prime Minister Ahmad Zahid Hamidi’s speech in the Dewan Rakyat on Wednesday, in which he said Malaysia preferred foreign workers from Bangladesh as they were more loyal and trustworthy. The home minister said 1.5 million workers from the South Asian country would arrive the next three years. Mr Zahid’s ministry is the overseeing authority on the recruitment of foreign labour. Mr Gopal said the five-year 11th Malaysia Plan (2016-2020) stated that Malaysia intended to reduce its dependency on foreign workers of up to 15 per cent of the total work force. He added that young Malaysians opted to work abroad because of lower wages and the lack of attractive benefits in the country. Some 350,000 Malaysians travelled daily for work to Singapore, which offers better take-home wages after conversion to the ringgit, he said.